He was born on May 2, 1946 in Sinikolaul-Mar. He graduated in Romanian language and literature from the University. He worked as a journalist at the Information Bukureshtyluy newspaper. 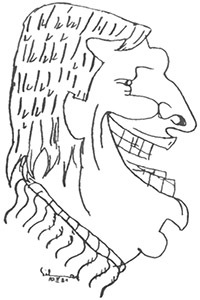 He debuted as a cartoonist in 1968 in the Urzika magazine; constantly published in newspapers and magazines. He held 5 personal exhibitions. He received a prize of the Union of Artists of the SRR at the Salon of Humor in 1976 and the Grand Prize of the Youth Bureau for Tourism. Awards abroad: The highest award in Istanbul (1979) and the II Prize in Skopje (1979).